Interactive Dog Toys have an important role in your dog’s life, keeping them interested, encouraging exercise and keeping boredom at bay. Dogs and toys are very like children and toys, some play nicely with them and others go flat out to destroy them, so it is advisable to supervise your dog with their toys. This means it’s best to choose toys that suit your dog’s nature, likes, dislikes and general temperament – aggressive or moderate chewer, this can be trial and error,as every dog is an individual with their own personality. Does your dog love to play catch, like to chew, spend hours with a puzzle toy or perhaps he loves to carry around a special cuddle toy. There is now a large variety of unique, high quality interactive dog toys on the market, here are some examples. These are a great chewable toy for puppies that have the advantage of being edible, easily digested and healthy, aiding brain and eye development. These chews are best given to your pup from about 3 months of age. Of course these edible toys will only last as long as it takes your puppy to chew them almost away, then replace them, ensure your supervisor puppies with these chews. These are strong dog chew toys that last well and most dogs love them. This size is suitable for dachshunds and getting the three pack is handy when you need to replace well chewed toys or may be toys too small to be safe. This toy is made of medium/hard natural rubber and is suitable for dogs that are moderate chewers. This interactive dog toy can be filled with treats to keep your dog busy, this size is suitable for your mini-dachshund. This toy appealed to me as it has no stuffing and the squeakers keep going even after multiple punctures. This product is available in red or green colors. 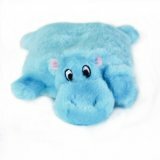 This popular plush toy is specially designed so it requires no stuffing. Most dogs love the unique squeaking sound. Available also in Duck, Koala, Pig, pattern and priced accordingly. 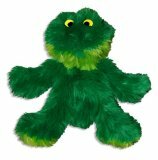 These quality plush toys are excellent for small/medium dogs. If your dog also likes squeakers then this toy will be a hit. Turn your game of fetch with your dachshund into a real fun time with this tug rope toy. This toy is very sturdy and good for small dogs. This dog chew is mint flavored and provides plenty of fetch fun while helping to clean your dog’s teeth and reduce plaque. 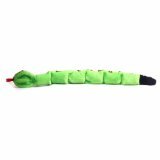 This tug toy is a very durable dog toy that is loved by many dogs. 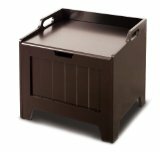 This attractive, solid dog toy box complements your home. The box is easy to assemble and available in non-toxic white or espresso and also comes with stickers to decorate if you wish. I think this box is a reasonably priced, quality product that many owners find handy helping to keep interactive dog toys off the floor. 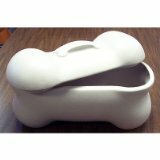 The dog toy storage shaped like a bone looks the part, stylish and practical. The lid fits securely so little paws cannot open at will, so if you have a tidy-up of toys they will stay away unless you open it. This bin is easy to clean. This brand of toys is one most dog owners will be familiar with as they are a company that produces many quality dog toys and they are a market leader. 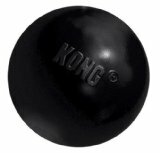 Many of the Kong toys are popular with owners of dogs who love to chew, as the Kong toys seem to last longer. This interactive dog toy is designed to keep earnest chewers occupied and out of trouble, you could say it is an almost indestructible dog toy. Made from safe, natural rubber and is about 3 inches long. This roll about dog treat toy, gives your dog hours of fun and especially when filled with treats, wet food or perhaps even peanut butter, your little canine friend will love it. These interactive dog toys are made in USA from a special rubber formula and have proved to be really tough dog toys. 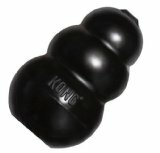 This ball is an excellent outside toss toy and it also has a good bounce so you and your dachshund will get plenty of exercise and fun with this Kong Dog Toy. These brightly colored toys come in a variety of characters. 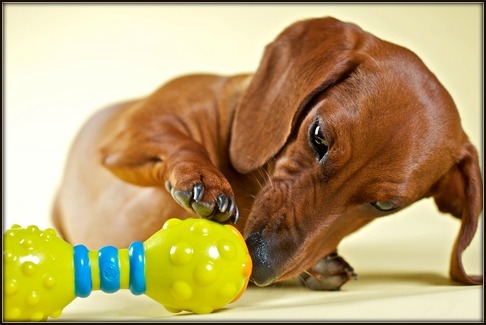 This cute reasonably priced toy is a good size for your little doxie and it will keep him occupied as it is squeaky, stretchy, tug able, toss able and just plain fun. 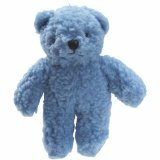 This Zanies dog toy is a popular sleeping companion for dogs who like to cuddle up to the little bear. Most dogs seem to like toys made from fleece especially the texture and softness. These are tough little toys that seem to last well. 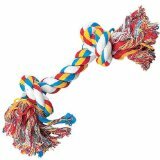 This rope toy is a good size for small dogs to enjoy and excellent for playing toss or tug of war to exercise, both you and your little dachshund. This brightly colored toy is dyed with completely natural vegetable dyes. 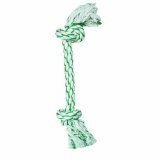 Rope toys like this also help your dog’s teeth and gums to stay healthy. This interactive dog toy keeps your dog busy working out how to get the treats and you can adjust the level as your dog learns. This treat ball gives your dachshund not only mental stimulation but also a good physical workout. 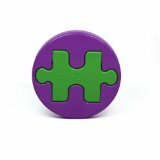 These dog puzzle toys supply your dog with mental stimulation and encourage interactive play between dog and owner, supervision is recommended. There are a number of other similar interactive dog toys available under this brand name Casino, Smart, Tornado, and Turbo to name a few. This well designed toy gives your dog hours of fun and also mentally stimulates him. Very useful if you need to slow your dog’s eating at meal time as this interactive dog toy has a large enough compartment to fit his whole meal. This toy is designed for tossing and retrieving not so suitable for aggressive chewers. 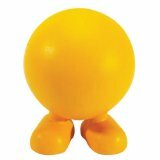 This easy squeak bouncy rubber ball is a durable fun toy. These unusual dog toys look like a ball with feet and are made from natural rubber comes complete with squeak. This ball toy is quite hard and because of its shape has an unpredictable bouncy which keeps everyone guessing. This fun for all toy is very suitable for small breed dogs . This plush toy made by Kong with the advantage of no filling and the squeaker is removable for washing. For safety it’s made from quality non-toxic materials. This puzzle encourages dogs to use their noses to lift lids and rotate the toy to earn the treats. This toy is a great activity to keep your dog busy and happy. Made from plastic so is dishwasher safe. 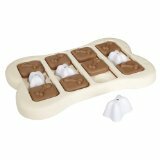 This innovative puzzle challenges your dog by using sliding interlocking panels to hide the treats. This puzzle is made from plastic so is dishwasher safe. ﻿Interactive dog toys help to keep your dog interested when home alone, Kong, Nylabones and Puzzle toys are good entertainment when you are not around. Always keep safety in mind,rawhide and older plush toys are best played with when you are home. It is recommended that you do not allow your dog to play with household objects or items of clothing even if they have been discarded. A good idea is to rotate your dog toys so he does not get tired of them.His interest is stimulated by the arrival of a new toy or perhaps one he has not seen for several weeks.